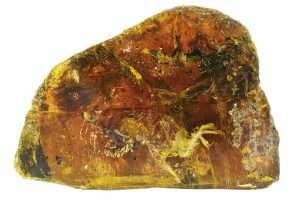 This big chunk of amber (fossilized tree sap) was found in the Southeast Asian country of Myanmar, or Burma. It contains traces of a bird that died after becoming stuck in the sap almost 100 million years ago. This is one of the best fossils ever found of the “opposite birds”–a group of birds that lived at the same time as the ancestors of our modern birds, but later became extinct. Who knows what other amazing fossils are waiting to be found?